Here are two of my featured images. 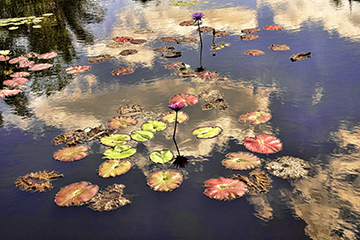 One was taken recently here in Naples Florida at the Botanical Gardens. The light was terrific, the clouds were positioned just right. 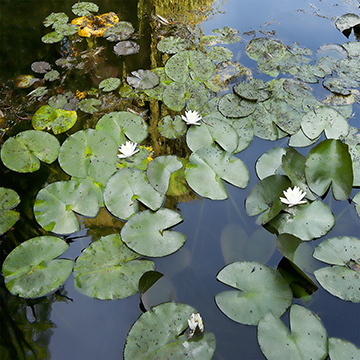 The other image I took a couple years ago in Giverny at Monet's Gardens. The light and cloud position created a nice smooth almost silky look to the lily pads. As we say in photography "it's all about the light" . Here we have two variations of a similar subject. They each present totally different moods and experiences. I'm always asked why I return to some of the same places over the years in Italy and France. The simple answer is I love visiting there and the images I take are always new and different. Different season, weather, light and time of day create new and exciting pictures. Browse through the many portfolios presented here. The images are available for your purchase. I print all my own images and can accommodate custom sizes.